This is according to CNN's online poll! Donald Trump and Hillary Clinton faced off in St. Louis on Sunday night for a widely anticipated second presidential debate and according to a CNN poll of of debate watchers, she defeated Trump 57% to 34%. This is a poor performance from Clinton compared to the first debate poll as 62% of debate watchers said she won in the first presidential debate online poll. 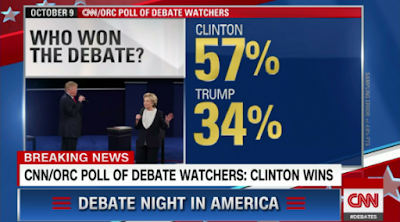 Note that this is CNN's own poll rating, a lot of other media organizations say Donald Trump won the debate.